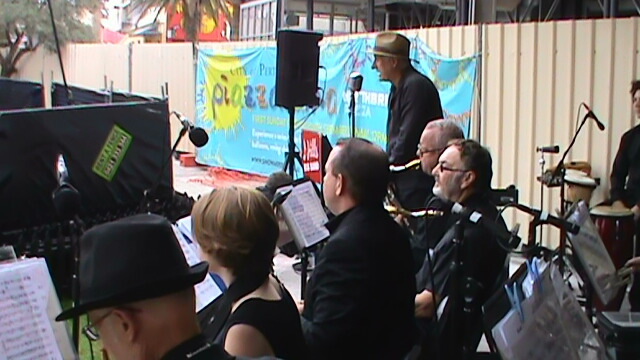 The Northbridge Piazza Live, on 27 April 2014, started well. 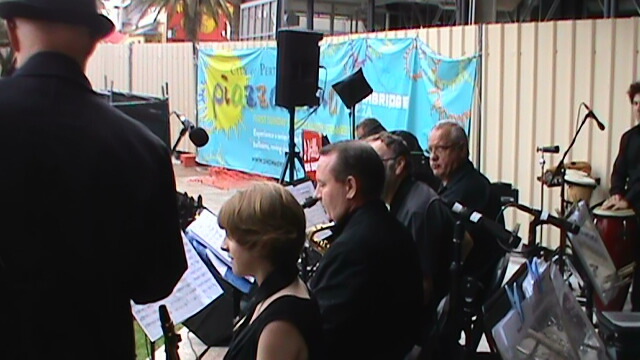 Café Jazz opened the concert with a sizzling set. 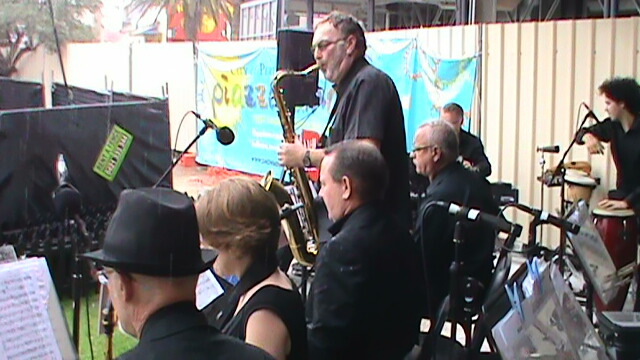 Gary introduced the Hills Big Band and expressed a desire for a continuation of the sunny weather, to match the fine music about to be performed. A few raindrops falling here and there - perhaps this would be just a very quick light shower, hardly noticeable. That would be ok, wouldn't it? Perhaps not. 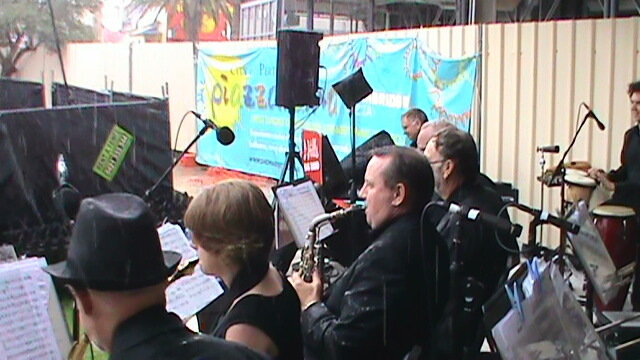 It soon became apparent that the weather gods had other ideas for this concert - the sky darkening, heavy raindrops becoming more constant. Oh dear. 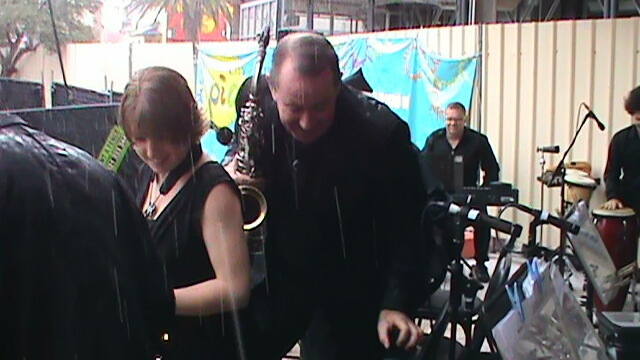 The front of the stage quickly became a mess of puddles as the rain increased. Quick-thinking sound technicians cut the power to prevent damaging electrical equipment, or worse, electrocuting musicians. Can't have that. 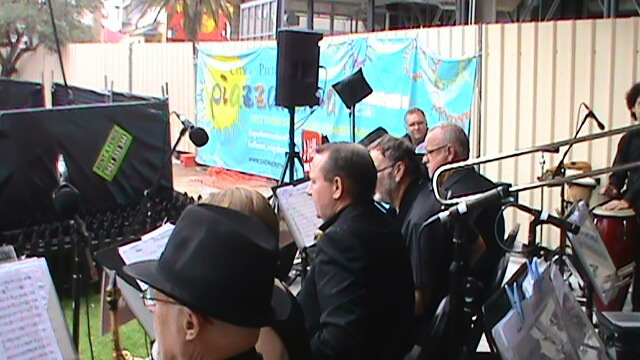 Simultaneously, members of the Hills Big Band suddenly noticed Kieran (Musical Director) adding a novel instruction to his conducting skillset - abandon stage! Everyone grabbing what they could, retreating to the shelter at the rear of the stage, and nearby greenroom, to dry off and assess damage. In a typical ironic twist, the rain disappeared after five minutes, returning the day to its former beautiful sunshine with occasional patches of cloud. But the show could not go on, because the PA speakers and all the rest of the sound equipment at the front of stage were sodden beyond safety limits.